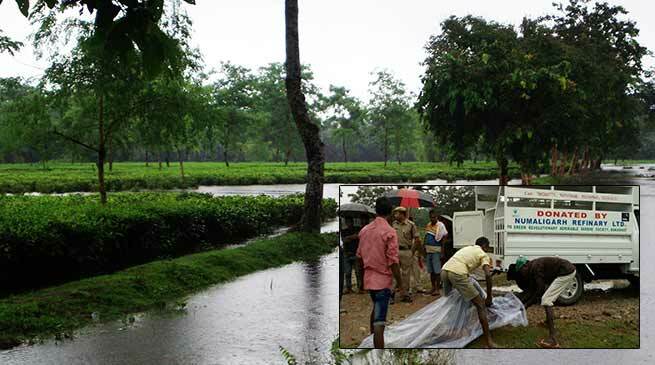 A tea garden watchman found dead after flash flood hit the Bokakhat are of Golaghat district in Assam on Thursday. Local Police have recovered the watchman at Gyandeep Tea estate located in the area. The dead watchman has been identified as Suneel Mura of Kaksang near Karbi Anglong who was working in former Bokakhat MLA Jiten Gogoi’s private tea estate. Villagers said that Suneel went missing on Wednesday last when the flash flood hit the area. Suneel is survived by his daughter and son-in-law. The incessant rain has caused the Difolu river to overflow, which has affected the normal life of the people in Bokakhat sub-division with the National Highway 37 at Lotabari has been inundated by rain water. However after few hours the water level come down in National Highway and traffic movement started . The floods also destroyed several hectares of crops in Siljuri, Kakjuri and Panbari area in Bokakhat. The Bokakhat administration and State Disaster Response Force (SDRF) have jointly launched a rescue operation in the flooded area.